This standing desk converter kit is the perfect tool to help you make your office a healthier, more active place. 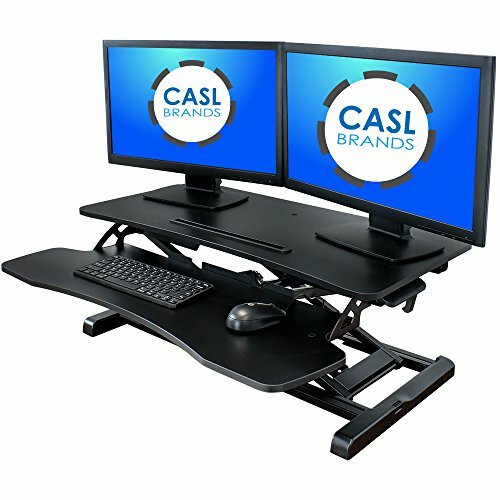 The desktop workstation features a gas spring assisted lifting mechanism so you can smoothly lift and lower the desktop using the handle for optimum positioning. There are 22 height settings ranging from 4.5 to 20 inches above your desk's surface so you are sure to find a height that works comfortably for you. The main tier of the desktop converter has a weight limit of 33 pounds with 31.5 x 15.75 inches of space, so you can use up to 2 monitors. The lower keyboard tier measures 31.25 x 11.75 inches and is fixed to the upper tier with 4 inches of space between the tiers. The weight limit of the keyboard level is 4 pounds so it can hold your keyboard and mouse. PLEASE NOTE the monitors, keyboard and mouse pictured are not included. If you have any questions about this product by CASL Brands, contact us by completing and submitting the form below. If you are looking for a specif part number, please include it with your message.